My apologies in being remiss in keeping my blog updated. My reason or excuse is my hard drive died on my computer. I do my blogs at home (I am sure the leadership at work will be happy to hear that) and so could not edit pictures or access the internet. While it was another short visit, I always feel a special level of happiness when I arrive on Yap. (And it is not without its problems, if I might add.) It happened the very first time I arrived and I had that same feeling of happiness and peace on this visit. I do believe it is a very personal thing, not everyone shares in my feelings of ease here, and that is their loss. My days were filled with visits to see the staff at Public Health, for whom I will always have a special place in my heart, visits to the refugees, visits with friends, and many walks around the lagoon with Shorty and Buddy and Cyd (Sid) when we left from the hotel and Blondie was joining us when we were up her way. We went to Mass at St. Mary’s and walked the stone pathway several times. Made a special effort to have at least one meal at each dining establishment, and more at those that allow Shorty to sit by my side. We also had a stop at our favorite ice cream shop and ate the ice cream in the park. And we saw many friends at the dances and enjoyed catching up on the latest island news. Connie, Daniel’s Mom, had a special dinner at their new apartment with a blessing, and they both are taking great care of Shorty and Buddy. As we were leaving Connie’s (we as in Shorty and Buddy and Buddy and me) a man told me that Buddy belonged to him, and I said nothing, but Buddy greets me like a long lost friend with as much enthusiasm as Shorty, and follows me around like that proverbial “puppy dog”, although he is getting quite old in dog years. So the dogs do get around and feel comfortable where they are safe and fed, and in my case with them, attentive. 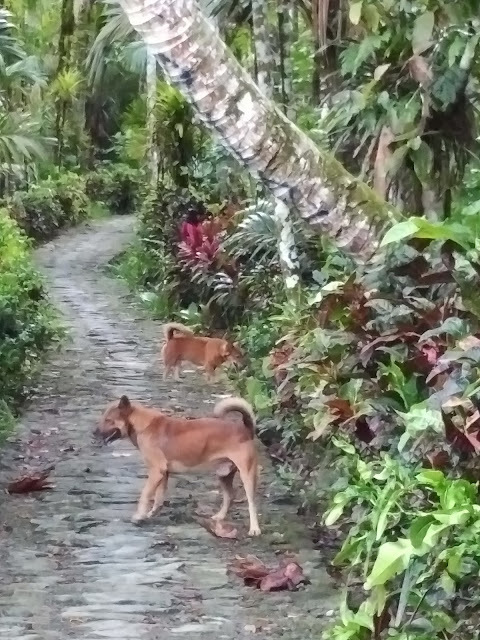 There are new pups at Oceania, and it was fun to watch them grow and make progress physically. I named the smallest one Logan and Daniel would like to adopt that one when she is a little older. 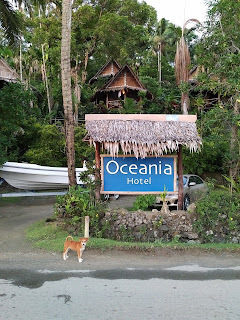 I stayed at Oceania Hotel, a lovely establishment where the individual rooms are built to look like the traditional house. Mark and Jen are the proprietors and are from the New York. We have become friendly and I do miss their company. They have done a great job in taking over this hotel and the rooms are spotless, there is hot running water, air conditioning, and everything inside works. You can get by with using the overhead ceiling fan. And each one has a lovely balcony with a view of the lagoon. Their cook, JR, is topnotch. He creates great tasting meals with beautiful presentations using local foods with a flare. Even if you do not stay at the hotel, it is worth a visit to the restaurant for a chance to enjoy a breakfast or dinner. And the $4.00 burgundy wine is not bad! A bargain at any price. The first event for the celebration was a very nice dinner at ESA. The food was excellent as per the usual at ESA. 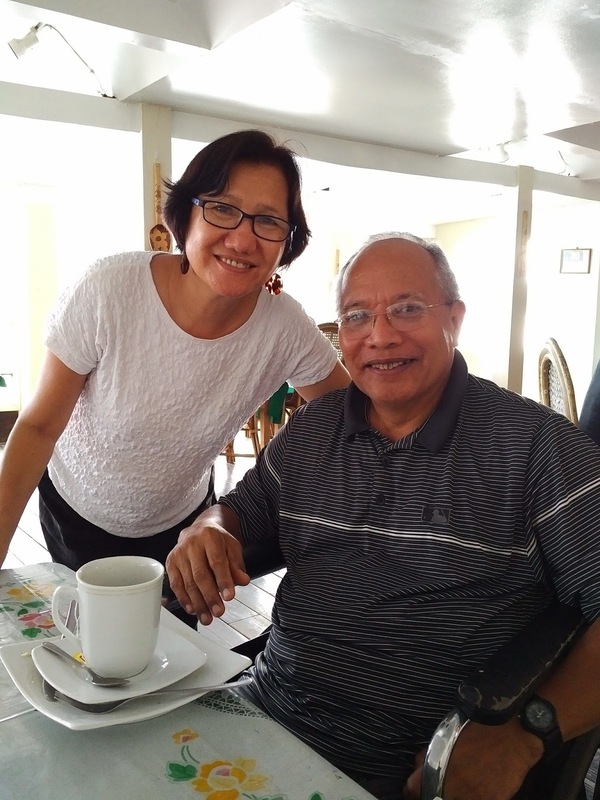 There were many people there, not many previous PCV, but locals who were involved in the PC program in both Micronesia and Palau. Both were US trusts, now both are independent countries. It was a great time to meet the other volunteers and share experiences. There is one annoyance on the island that many have tried to change, but without success. On Friday night, the music blasts from the Pine Bar Grill. Since it is located on the lagoon, the sound travels far and wide. Unfortunately, the music blares until 4 AM. Yes, that is 4 AM. The band stops at 2 AM and the last two hours is recorded music. It disrupts the life and sleeping of everyone who lives on that side of the bridge and no one seems to be able to convince the owner not to do that. I thought ESA and Oceania should have a late night special, then people can hear the music and enjoy dining and drinking at another place. The food and ambience at Pine Bar is great. And I do enjoy my visits there very much. But the loud music until 4AM is a major deterrent for many people. A compromise could be to stop the band at midnight, and play music quieter if they must continue to remain open until 4 AM. The next day of events for the PC included a fair type of atmosphere, where I bought a lovely water color from a local artist, and many types of island crafts were available. It was a fun atmosphere and I think the organizers did a great job in managing the set-up. One thing that they could have done was to follow tradition and give all of the returning PCV a nu-nu so that they could be recognized in the audience. There was recognition of one volunteer only, one of the first group of volunteers in Yap. Otherwise, if someone did not know you, they would not know you had previously volunteered in the communities. I think this would have been particularly important for those who were there many years ago and may not be recognized. This was another very special trip. I have many fond memories of friends and colleagues and experiences in observing the traditional dances and other ceremonies. There will always be a special place in my heart for Yap. Here are a few pictures of the visit. I hope you enjoy them. This is the hotel where I stayed. Right across the lagoon with beautiful views from the balcony. Highly recommended. The restaurant serves high-quality meals prepared with local ingredients. Sadly, the cure puppy in the front was a victim of a MVA shorty after I left. And if you look carefully at the houses, the center one is mine, following the local tradition of hanging laundry outside. One of the lovely rooms at Oceania. Mark, a proprietor of Oceania. Jen was in New Jersey. I missed her company. Cyd's two pups - the late Small & Terrible and Burt. Burt is being adopted by a local family. They both were a joy and have beautiful smiles, just like their Mom. They were waiting for me at my door step in the morning. 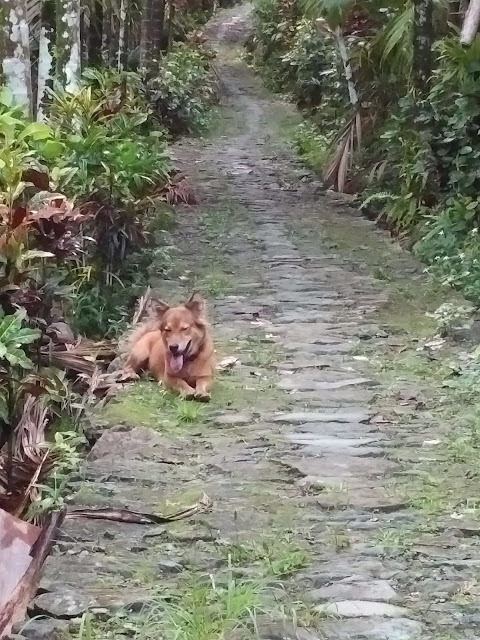 My dog Shorty, resting on the stone pathway, waiting for me to catch up. It was really hot on this visit, for Shorty, Buddy and me. Shorty and Buddy on the stone pathway. A beautiful walk, it is a workout in the heat. The men's dance is held at night. The women did a tribute to President Kennedy, who created the Peace Corps. Three young American PCV were among the dancers for this tribute. Can you find them in this picture? Love watching the little girls and boys participate in the dances. They are learning the traditions and this is one of the most beautiful in Yapese culture. Angie, a friend of mine from Public Health, and her brother, getting ready for the bamboo stick dances. These are high energy dances and a real crowd pleaser. Perhaps I enjoy taking photographs of the preparations as much as the dance itself. So much work goes into preparing the dancer, all help done by Mons and Aunties and Grannies. And much effort is made by the dancers as much practice is needed. A major commitment on the part of the dancer, family and community. And well worth the efforts. Dancers performing the stick dance. The man on the right is Don Evans, who has lived in Yap for many, many years and done many wonderfult things to promote the culture. He also was in charge of planning the events. The man on the left built the canoe. I apologize for forgetting his name. This is Tim Ruda. He was the MC for the event and he also works at the airport. Shorty quickly found a cool refuge under the stage. He could nod off and still know if I left as my legs would be gone and he would get up to find me. Shorty is really quite fond of Buddy. But Buddy is teaching Shorty some bad habits, or are they survival strategies? Wrestling was also included on the agenda of events. It is unusual for girls to wrestle, and while I don't know the rules of the sport, it appears that she won. This canoe sailed to Colonia from Maap. Maap is on the northern part of the island. Buddy found a little friend. She liked Buddy from the start. A lot of people are afraid of him because he is big, but these two made fast friends. A long day, Shorty slept well. Cyd. (or Sid). Jen's dog who had puppies. She is cute and has become a dog pal of Shorty. JR, chef at Oceania. If you are going t o Yap, do not miss one of his specials. Connie and Father John. Connie is Daniel's Mom. They help take care of Shorty and Buddy. Daniel and Connie. This was an open house after they moved into a new apartment. The house was blessed to keep all who enter safe. Including Shorty and Buddy. 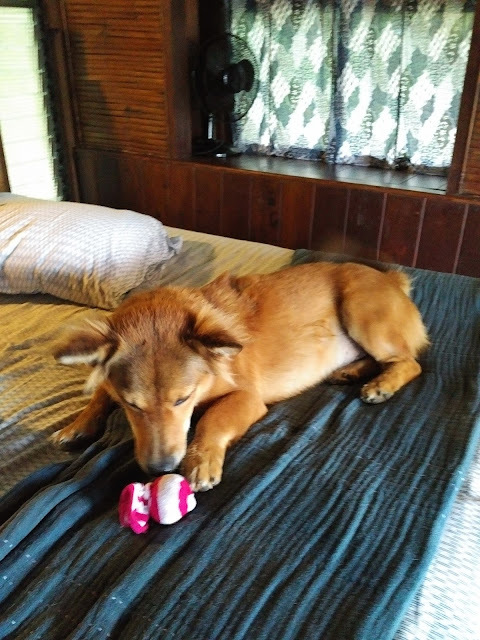 Shorty playing with one of my socks that I made into a ball for him. He had no intention of sharing with Cyd. A quiet place under the car at the break of activities. Shorty is in the front, Buddy is in the back. Both protected from the brief rainfall during intermission. There are more pictures to share and I will add them as I can. Right now I am in Johannesburg as a recipient of a Fulbright award. I am at the Witswatersrand University.